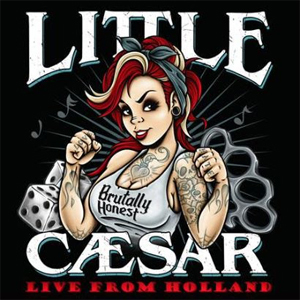 LITTLE CAESAR's new live album, Brutally Honest is now in the final stages of mixing. Recorded live in Holland in 2015, it’s a double CD and as the title suggests, there are no overdubs, clean ups, pitch corrections or any of the other studio tricks that make a live album “controlled” or falsely polished. It’s the first live release in the band's 30 year career. It captures the group's live energy and love for their music and fans. Stay tuned for free downloads and a release date in the very near future. Check out the artwork for Brutally Honest below.